Jean Lukaz studied for a Masters/LLM degree in International Law and Politics at Hull between 1999 and 2000. A: I was born in Kumasi. Hailing from Ejisu from the Kronko Stool, on the same street as Yaa Asantewa (the warrior queen who fought the British) and with some lineage to her. I am heir to some throne, I am told. I am not keen on it either. My Dad kept me away from village life and took me to his hometown Kibi-Apapam only once, at a time when the source of the Birim River was still virgin unlike its present polluted condition from gold mining. I began to show talent in French in Class 3 and exceeded all expectations at PRESEC-LEGON by winning the Greater Accra Regional French Competition and gaining an ‘A’ in French against all odds. I excelled onwards to my Bachelors Degree where I obtained Honours in French and Russian with Spanish. However, I never pursued my language talent academically after my Bachelor's Degree but rather continued to learn more foreign languages of my own. Q: How did you come to leave Ghana? 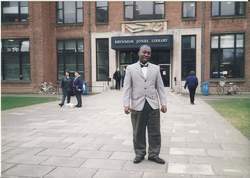 My first experience of living abroad was in the UK, in London, in 1995. It made me despise every country apart from being home in Ghana. We got burgled at my Auntie's on a day or night when I had gotten lost from Bethnal Green after work at midnight. Not knowing where to go after the Underground was closed, I just took the Night Bus and fell asleep. I had ended up in the beautiful West End but needed to get back to Woodgreen and stay awake! I eventually got home at 2am by which time my Auntie thought I was an accessory to the burglary, since I was usually the first to come home in the evening, the burglars had used a key rather than broken in, and worst of all, every room was ransacked apart from mine. Shortly afterwards she bought a new house in Tottenham, but wouldn’t give me a key so I had to leave at 6am because that’s when she left and had to walk around until I started work at 9am. At the other end of the day I had to hang around in the streets when I finished at 5pm because nobody was home till 9pm. This was September-October....and my clothing was not that warm for the autumn. I had migraines throughout my stay. I had no Duvet, Comforter or Quilt either oin my bed. You can imagine the economics on heating too at home! In 1996 I spent one year in Russia but the fourteen hours Aeroflot flight from Ghana to Moscow, with practically no legroom on a plane that will usually be reserved for domestic flights, was a foreboding of what it was going to feel like during my stay at Pushkin Russian Language Institute. It was racism at its democratic peak! I had to be jumping on moving buses to save my life from marauding skinheads! Q: Having been to London and Moscow, why did you choose to come to Hull to study? I came back to Britain again in 1999...another nightmare! I landed at Hull Airport on board KLM...with only £20.00 in my pocket, to do a Master's Degree, and not on scholarship either...with nowhere to lay my head!...son-of-man. There were other Ghanaians on Chevening Scholarships who were also on my flight, I discovered during our transit at Schipol Airport. I had never heard of Hull till a course mate took the lead to study at the University of Hull and I followed his tracks. He told me much about both the City and University of Hull. It was the early days of internet on campus at the University of Ghana, Legon, and only the internet cafe or Balme Library could receive your email and print it out for you to pick it up. I never tried other Universities either in the UK or elsewhere. Hull was a colder environment (nothing close to the minus thirty degrees Celsius in Moscow sometimes) and cost of living comparatively cheaper than other cities in context. Moreover, the University of Hull ranked higher in some Departments among their competitors in the UK. In fact, I did not know whose career I was pursuing then. I just wanted to have a Master's Degree, period. My Dad wanted me to be an Engineer but I dropped science because of difficulties I foresaw, coming from a step-home. Then he wanted me to become a Professor. I love teaching and it comes to me naturally but I easily get bored doing the same thing for a while. Q: Tell us about your student life. It was just a one-year Masters Degree programme in Hull after which I moved on. I lived quite close to the University of Hull main campus. I ended up with two Master's Degrees and did a lot of supply teaching in Schools in Hull and in Birmingham while studying. In Hull, sometimes I will teach in a school during the day and the security firm I was working for will post me there at night. It was a tough life and I wouldn't want to live it again. I would rather be on a scholarship to study abroad for advanced studies. However, the best experience in my life was teaching different sets of students grouped in classes according to their levels of intelligence as well as separate ones for others with special needs. I spent quite a long time with some schools teaching French and Spanish and became a tutor for a year group. Both students and parents as well as departmental staff were surprised that an Anglophone from Ghana could be teaching French so well, as I even introduced new teaching methods that made the students speak foreign languages so quickly. I got observed by some School Heads too. I was quite taken aback when I observed that each school took some Anglophone African country to study in some courses. Particularly, one History classroom was decorated with photos of Leaders, Freedom Fighters and Nationalists of former British Colonies and the Commonwealth. Yaa Asantewa was in the roll. The non-contact teaching environment was obviously the opposite in most public schools in Ghana. But all this was not without the challenges of racism from some staff and students. Q: What were your first impressions of this area; people, place etc? The best about Hull as a student city is its smallness and the proximity of the University of Hull to the city centre, a walking distance. The Yorkshire accent was hard on my ears but I picked it up gradually. The people of Hull are friendly but not the student housing agencies that discriminated highly in their rentals. Dilapidated and bogus ones are shown to us and the good ones shown to others. I angrily confronted an agent who happened to insult a PhD Ghanaian female student and the Ghanaian Ambassador in London for delays in her scholarship payments covering her accommodation expenses. He nearly hid under a table for fear of being punched in the face. When I look back to my days in the city of Hull I remember Princess Avenue, Auckland Avenue and Hull International House, Princess Quay, the Ferry Trips to Rotterdam En route to Amsterdam, and the nightclubs. I was very popular among the Jackson’s shops as a Security Guard for being able get the highest number of arrests in the shops for shoplifting. I remember spending all Christmas and New Year locked in closed shops because the money was good...how boring! I could never earn enough to pay my rent...oh, what a life! Q: What events stand out in your mind? One day while working as a Security Guard in Hull I was posted to a place at night where I could smell cocoa beans all over. I was wondering where the sun-dried cocoa beans were coming from so I drifted into the yard and found an empty cocoa jute sack. I flipped it over and the bold print starred at me in the face: GHANA. Some kind of epiphany I was not expecting. Wow! But there is no chocolate factory in Hull? Then I began to recall the role of Hull in the slave trade and the relationship between cocoa and slavery from Ghana to Hull while contemplating the role of Wilberforce. I never followed up on my research only to delve into writing on the subject later on as part of my 'Dark Tourism in Ghana' series http://www.nathanielturner.com/darktourisminghanajosephproject.htm . Q: Why did you leave and what happened next? I left after my studies and went globetrotting across the world. I settled in Ghana but it seemed I was cut for the world at large and not for Ghana in particular. My Belgian girlfriend, whom I met in Hull, wanted me to settle in Belgium so we could be together. I had my Ghanaian girlfriend I wanted to marry just because I wanted to pursue Doctoral studies right after my Masters Degree and now I had to lose another for the reason that I did not want to settle in her country. Life had to go on. I would say that I never put to use anything I studied in Hull as a career yet. I have been in and out of entrepreneurial activities, logistics, real estate, newspaper columnist and editing, football team management, branding, consumer protection advocacy, national standards development, business development, travel and tourism, national tourism branding and marketing strategy development, hospitality management, strategy, project financing, lecturing, training, etc. I work for myself as an independent contractor and consultant. Q: Do you keep in touch with anyone you met during your time in this area (from here or from elsewhere)? Unfortunately, I was using excite.com as my email domain and since the company’s collapse, I lost all who were on my university mailing list. I sometimes come across the Ghanaians who were in the city during my studies but not the other foreign students. I wasn’t much of a sociable person, anyway. Q: What do you think was the biggest lesson learned during your time in this region? A: ‘Follow your bliss’, is the advice I would give everyone, in spite of your intelligence, brilliance and smartness. There’s no use pursuing any ‘dreams of my father’, to misquote President Obama’s book title, or those of people who believe they know what you are cut for. God’s purpose for your life has got nothing to do with your qualifications, either. After studying in Hull, I felt I had wasted one year of my life struggling and chasing an illusion. But the best was yet to come. I would not say I have achieved my dreams yet. My dad always queried why I got 1% wrong and never praised me for getting 99% right. That kind of Samurai Training keeps me yearning for more territory and never being complacent... It seems motivating but not for the unadventurous. It has all been an adventure so far.